Annual gift exchanges, holiday parties, and other festivities are a staple of modern work life. We spend so much time with our coworkers – it’s natural that we would want to buy them something during the holidays, and build our relationships with them by picking the right gift. But while gift-giving at the office is fairly common, the specifics of the types of gifts you should give can often be hard to figure out, leading some people to have many questions about the etiquette of office gift-giving, and making them nervous about buying the wrong gift for their particular situation. What’s my price limit? Will I come across as stingy? Should my gift be personal or professional? These questions are especially common if you’re giving a gift to a coworker who you don’t know as well – or even a supervisor or other person higher up at the company. So what’s the solution? Well, there’s no “catch-all” – exactly what gifts you should give depends on your relationship with your coworkers, your position, your budget, and a variety of other factors. However, there are some basic guidelines that you can follow to ensure that you choose an appropriate, on-budget gift for a coworker who will appreciate it, and remain professional during the entire process. Read on, and learn more about the etiquette of the workplace holiday gift exchange. If you’ve been nominated to run the office gift exchange or Secret Santa, congratulations! You have the power to make sure that your office gift exchange goes off without a hitch. But, counterintuitively, the first step you take should be making the gift exchange optional. Many people struggle during the holidays – it can be a time of stress and difficulty for those among us who may have personal issues with specific holidays. Giving them the option to opt out of the gift exchange can be very helpful, and they’ll surely appreciate it. In addition, others may have religious reasons for not respecting the tradition. It’s not as if a gift exchange is necessarily “focused” on Christmas, but this can often be the feeling that it gives off, so some folks who are devout and wish to not be involved may respectfully decline involvement. Finally, some folks simply may not be able to afford it. If times are tight, budgets are strict, and money doesn’t allow their participation, they shouldn’t be forced to do so. It may seem strange to begin with this step – after all, you do want the whole office to participate. However, you don’t want to seem like you’re forcing them to do so. That creates an atmosphere of stress and negative feelings, and that’s not how you want to start your office gift exchange. This is one of the best guidelines you can follow. Simply, set a certain spending limit for each participant in the Secret Santa or gift exchange. Of course, some people can exceed this limit if they really want to, but this is quite rare – usually, when people are given an upper limit for spending in an office gift exchange, they abide by the rules or stay quite close to the spending cap. Having a defined, measurable expectation of value ($25 is a good starting point) allows coworkers and colleagues to buy gifts without worrying if they’re spending too little – or too much. This allows selection of gifts to go off without a hitch. There are no bad feelings of jealousy or disappointment among recipients of gifts, as each gift has a set monetary value associated with it. Avoiding feelings of disappointment and jealousy is crucial – employees may feel disappointed if the gift they receive doesn’t meet their expectations. They may feel silly about it – especially if it’s relatively low in value – but we’re all human. Expecting one thing and getting another feels bad whether you’re 6 years old or 60 years old. Doing just a little bit of investigative work on a colleague or coworker that you’re exchanging gifts with can reveal some great information that can help you learn more about their preferences, likes, dislikes, hobbies, and family. Even just this basic information about what they like can help you pick out a wonderful gift that they’re sure to love. For example; you’ve drawn your coworker Doug for the gift exchange. He’s in marketing, you’re in sales. You’ve been coworkers for over two years. You talk sometimes, but not that often – you’re not really close. You don’t know what to get him for the gift exchange – just giving him some general gift card or another simple gift seems wrong, given that you’ve known each other for over two years. So you try to find more out about him. You check his Facebook page and see a picture of him grinning with a child holding a fish. You walk over to his desk while he’s not there and check around – sure enough, there’s a beautiful smallmouth bass stuffed and mounted, stuck to his cubicle wall. Finally, you mention to Doug that you’re thinking about going fishing sometime soon with your father, and his eyes light up, and he starts talking about fishing trips he’s gone on. Boom! Just like that, you’ve figured out the perfect gift – even if you don’t know anything about fishing. If you actually do like fishing, you could get him some nice lures, fishing line, and other useful fishing-related items. And even if you don’t know a fly-line from a backing-line, you can get him a gift card to REI, Bass Pro Shops, Dicks’ Sporting Goods, or another outdoor shop with plenty of outdoor and fishing equipment. Doug will be happy that you did that extra bit of research, and you can strengthen your relationship as co-workers, and make sure your gift is perfectly appropriate for the situation. This rule is simple. You’re giving gifts in an office setting – therefore, they should be professional. Avoid gifts like lingerie, cosmetics, cologne and perfume. Tobacco and alcohol products should also be avoided unless you have a good knowledge of your office culture and know that a nice bottle of whiskey or a pack of high-quality cigars is an appropriate gift. In general, the best way to think about this rule is by asking yourself if you’d feel comfortable discussing a gift to a coworker in front of a supervisor. Would you talk about buying cologne for your coworker in front of your supervisor? Or lingerie, for that matter? If you wouldn’t feel comfortable discussing a gift in front of a supervisor, that’s a sign you’ve gotten too personal, and you’ll either make the recipient of the gift or your other coworkers, uncomfortable. Regardless of your relationship with your coworkers or the intended recipient of your gift, you’re still a professional in an office, and your gifts should all reflect that. Humor is perhaps the most subjective taste of the entire human experience. You may think that giving someone a whoopee cushion as part of their gift exchange present is hilarious – and your coworkers might agree! They might think that it’s good, clean, and funny – not embarrassing. However, the coworker you give that gift to could be totally humiliated. Some people are uncomfortable with laughter – even when it’s not directed at them, or at their expense. Humorous or inside-joke gifts are not a great idea for office gift exchanges. Your recipient could interpret a funny gift the wrong way, and you could do irreparable harm to your relationship. So steer clear of humor. Your gifts should be well-intentioned, professional, and chosen to evoke appreciation and joy, not humorous or designed to provoke a specific response in your recipient. Sometimes, you want to show your appreciation for a specific coworker. Maybe one of your salespeople really rocked it this year, and grew his sales 400%, helping the company expand and leading to great bonuses for everyone in his department. Maybe your boss has been stressed and could use a pick-me-up, or you want to show how you’ve appreciated their great leadership and supervisory skills. Whatever the situation may be, a spending pool is a great option to buy a special colleague something that’s a bit more expensive and special than a traditional, $25-$50 office gift. Get together with coworkers who also want to express their appreciation, and pool your money together to buy them something special. This is a useful technique because it avoids breeding the appearance of favoritism – when an expensive gift is given by just one person, it can easily be interpreted as that individual attempting to curry favor with a colleague – especially if the recipient of the gift is higher in the corporate chain. By pooling money together between several different colleagues, the gift is what sends the message – not the person responsible for giving it. In addition, the recipient feels special – they know that there are multiple people who appreciated their performance, attitude, or other aspects of their work enough to get together and devise a group gift-giving strategy. This is perhaps the most important rule of all. Look, you’re not always going to get what you want from an office gift exchange, or from a well-meaning coworker. But just because you didn’t get what you want doesn’t mean you have to make the gift-giver feel bad. In fact, having a poor response to a gift can be extremely damaging to a professional relationship. The gift-giver will feel bad because they chose the wrong thing, or bitter because you didn’t express your appreciation. Keep it professional. Whether you’ve been given a brand new, current-year iPhone, or a $10 gift card to McDonald’s, say thank you to the person who gave you your gift. Smile and be sincere. After all, it’s the thought that counts! Going further than a verbal “thank you” can also be quite appropriate. Writing a nice holiday-themed “thank you” card or a handwritten note is a great gesture of appreciation, and your coworker is sure to appreciate. Do note that unless you’re participating in an office-wide gift exchange, you’re not required to reciprocate the gift that a coworker gives you, especially if it’s a surprise. These sorts of gifts aren’t given with the expectation of a gift in return. However, if you feel like being prepared, you can be prepared with a small stash of pre-wrapped, generally-applicable office holiday presents like Amazon gift cards or other widely-useful gifts. A person who surprises you with a gift and doesn’t expect one in return will be doubly surprised and thankful if you reciprocate their gift! You Won’t Always Get What You Want – But You Can Trade It For Cash! Gift cards are probably the single most common present given in office gift exchanges today. 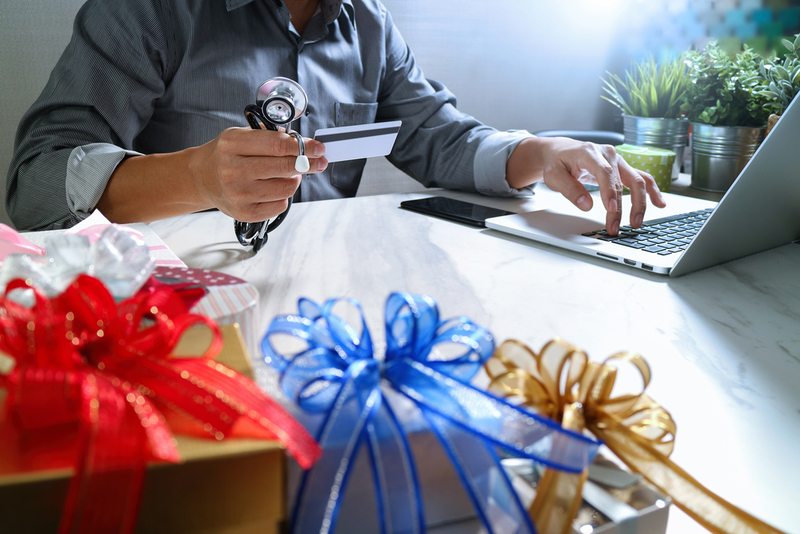 They’re more thoughtful and suitable for gifting than cash, and still allow recipients the flexibility to choose what products they’d wish to purchase. But sometimes you don’t get the gift card you want – so you’re stuck with $25 to Chili’s or $50 to The GAP that you’re never going to use. There’s an easy solution – direct gift card buyers like EJ Giftcards. We offer extremely competitive rates on literally hundreds of gift cards. Just about any valid gift card can be exchanged for a competitive percentage of its value, delivered directly to your PayPal account as soon as the sale is finalized, or the tracking information of a physical card is sent. We offer great rates, instant payments, an easy, step-by-step sale process, and robust customer support to answer any inquiries you may have about our process and our services.